One of my favorite things to do with my girlfriends is to get together for coffee and to catch up while our little ones are at school. 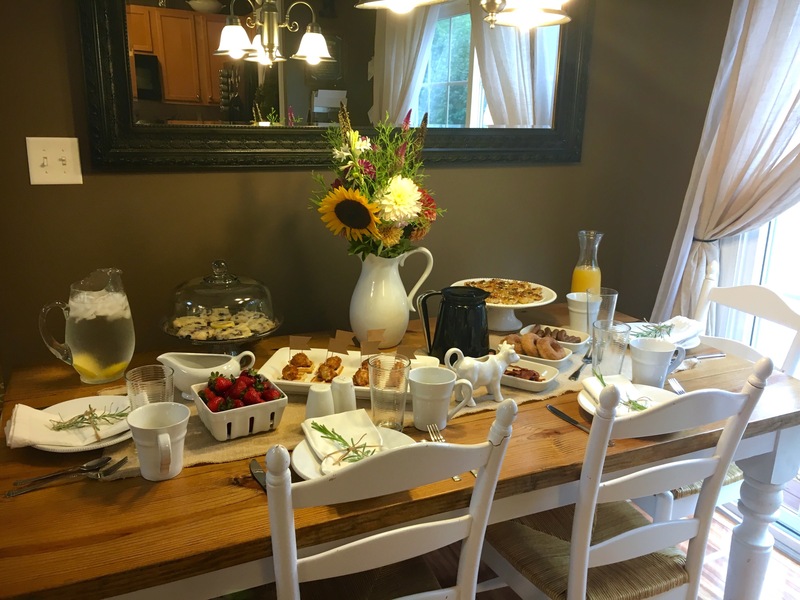 We try to do this once a month and it usually consists of coffee, baked goods, good conversation and even better company! Both my boys happen to be at school this day so I thought why not do brunch and let the girls taste some of my new recipes I’ve been wanting to put on the blog!! I would have to say that brunch is the best meal of all! A combination of breakfast and lunch! The best of both worlds if you ask me! 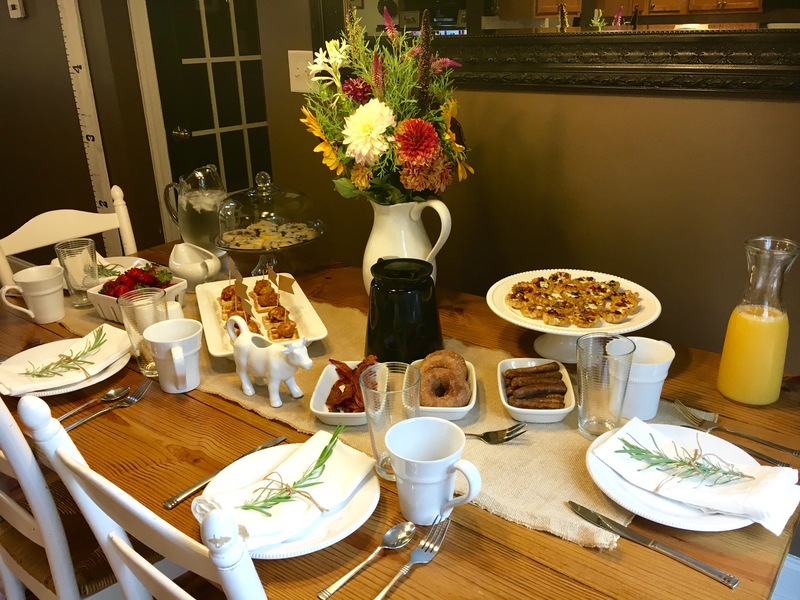 I loved the way this brunch turned out! This really was a simple spread. Little stress! I love menus that you can make the majority of the items ahead of time. To me there is nothing worse than slaving in the kitchen while guest are arriving! So I thought I would break down for you the recipes and tips for an easy, simple, yet tasty and elegant brunch! Here are my simple tips to dressing up a brunch! They are easy and you wont have to spend much time or money doing it! Flowers: The day before your hosting your event stop at your local farmers market or grocery store and pick up a bouquet of flowers as your center piece. This beautiful bouquet was only $10.00 and it really brings life to the table! If you have flowers growing in the garden even better! Cut them and place them in a vase. Cloth Napkins: Cloth napkins are a cheap and simple way too really dress up your table settings! Fold nicely and tie with ribbon or twine and slip a sprig of rosemary or lavender from the garden in your twined or ribbon! Simple, cheap but looks elegant. Cake Stand: A cake stand is not just for cakes! It is a nice way to add height to your table and to display baked goods or Quiche or frittata! Table Runner: A table runner adds an elegant touch to your table. It doesn’t have to be anything fancy! I used a $3.00 piece of burlap! Menu: When choosing a menu I always like to go with one item that contains eggs, one to two items with meat, one baked good and a fruit. Beverages: I usually like to provide two drink choices. One always being water. It is easy to place a pitcher of water on the table and dress it up with sliced lemon. The other beverages I usually go between is coffee, OJ or mimosa. You could even do bloody marys if you see fit! Here is the menu that I came up with for our girls brunch! Like I said above a lot of these items I made the day before! Making it a simple and enjoyable brunch to host. Cook bacon and crumble into a bowl and set aside. In a larger bowl crack eggs, add milk, salt and pepper to taste and scramble with a fork. Add tomatoes, bacon, chives and mozzarella to egg mixture and incorporate well with a fork. Remove fillo shells from package and with a large spoon ladle mixture into each individual shell. About 3/4 of the way full. Cook at 350 degrees for about 12-15 minutes or until egg is cooked. 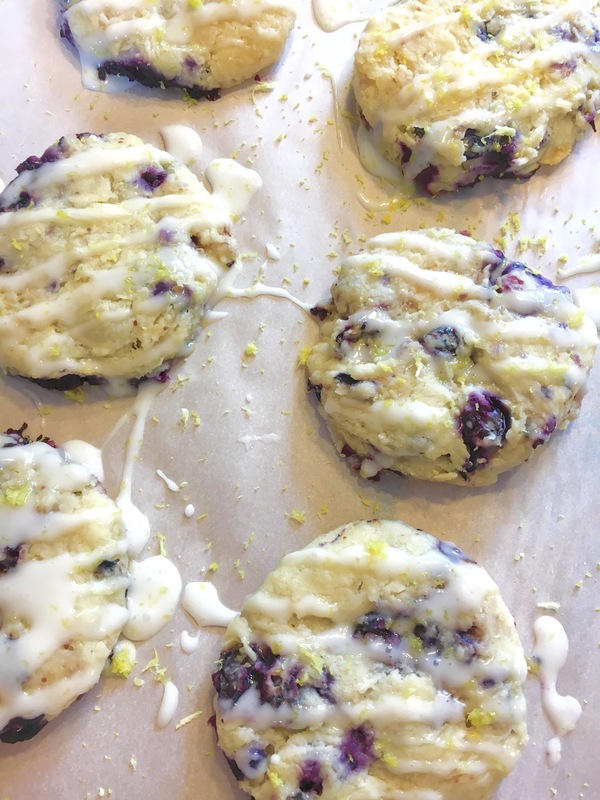 This recipe I found from another blogger’s site. These scones were delicious! I just cut them into circle with a cookie cutter instead of into triangles like the recipe below calls for. Click the link below for the recipe! Chicken and waffles are a unique and amazing addition to brunch! I highly recommend taking the time to make them and to make the sweet pepper jelly! The girls LOVED this recipe! This was the star of our brunch! The sweet pepper jelly I found on a fellow blogger’s website. If you have never made or had sweet pepper jelly you are missing out! The jelly alone is delicious and perfect to keep in your pantry for an appetizer or to put on meat. 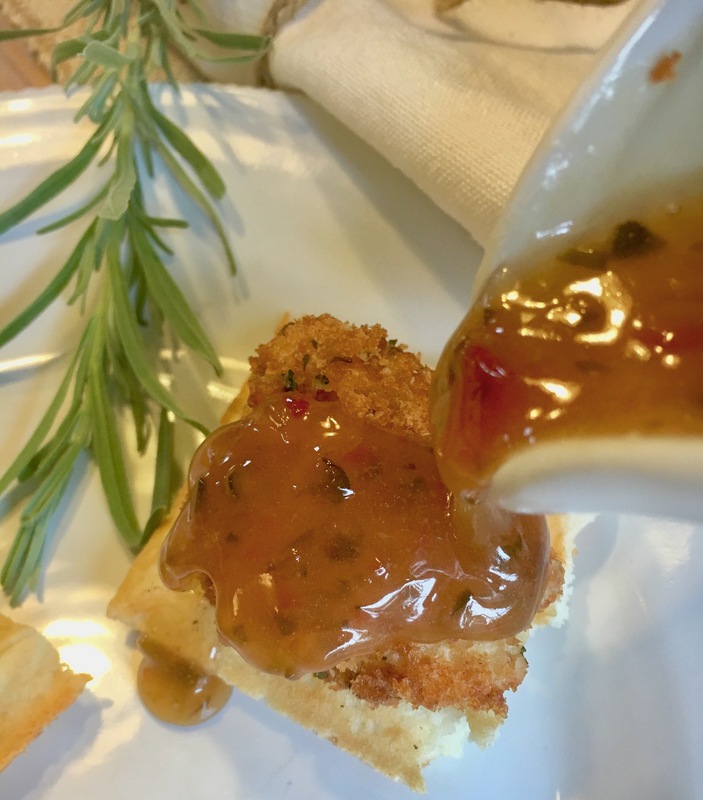 This pepper jelly syrup is what completes this chicken and waffles so don’t skip the jelly!!! It’s also a great way to use up those peppers and jalapeños from the garden. Of coarse if you dont have time to make your own you can always purchase a jar! In a small mixing bowl add jelly and maple syrup. Stir until combined well and ladle into serving dish and set aside. Diced chicken into cubes. In three separate bowls put flour, egg and bread crumbs.Scramble the egg. Heat oil in a pan on medium to high heat and begin breading your chicken first dipping chicken into flour, then the egg and lastly into the breadcrumbs. Once oil is heated place chicken in pan until golden brown or fully cooked. Set aside. Mix up waffle mixture into a bowl following the directions on the label. Then spray your waffle iron with a non stick spray. Place 1/2 cup of waffle mixture into the waffle iron and allow to cook until golden brown. Repeat. Once waffles are cooked, slice into smaller bite size squares. 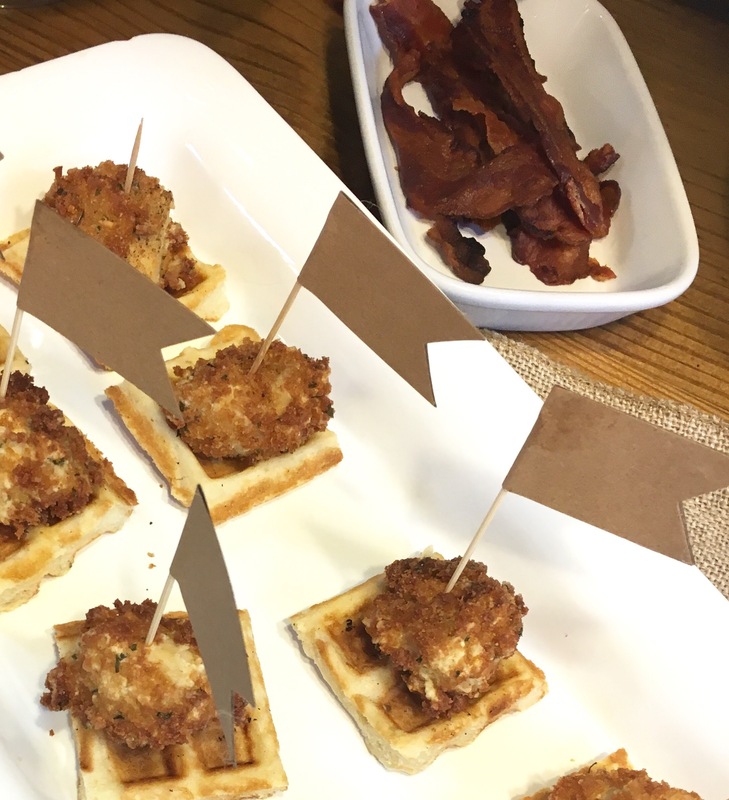 Place a piece of chicken onto waffle and secure with a toothpick and place on your serving dish. Serve with warm pepper jelly syrup! TIP: I left the chicken and waffles to make the morning of. This was the only item on the menu I didn’t make a head of time. The pepper jelly syrup I made the night before and reheated before serving. 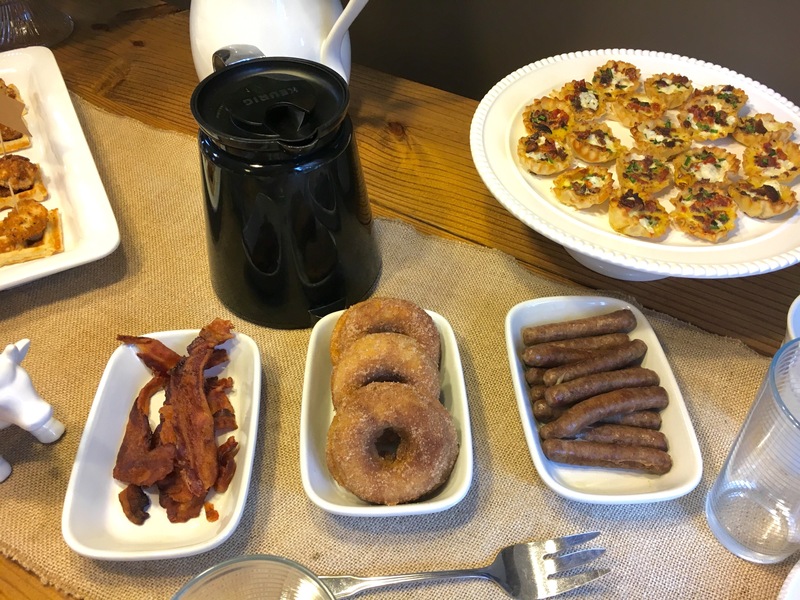 This recipe I also found from another blogger and these donuts are really tasty! They are super moist and a perfect addition to a brunch menu! In addition to this menu above I also served strawberries, bacon, sausage, coffee, water and orange juice. I hope you enjoy this brunch menu as much as my girlfriends and I did! Check out some of my other recipes that would be perfect to add to your brunch menu! What a treat. Everything looks amazing! Can’t wait to make those baked donuts 😍! Thanks Lisa!! They are so good! !